Sometimes the best toys are ones that can be bought on the cheap at the dollar store or in the bargain aisle. And often, the company behind these toys is Chap Mei. The Hong Kong-based toy maker has long produced a variety of figures and playsets that turn up in discount stores, and more recently, even large chains like Toys R Us. What's cool about Chap Mei stuff is it tends to have a sort of generic charm that smacks of 1980s nostalgia, but at the same time is pretty well-made. 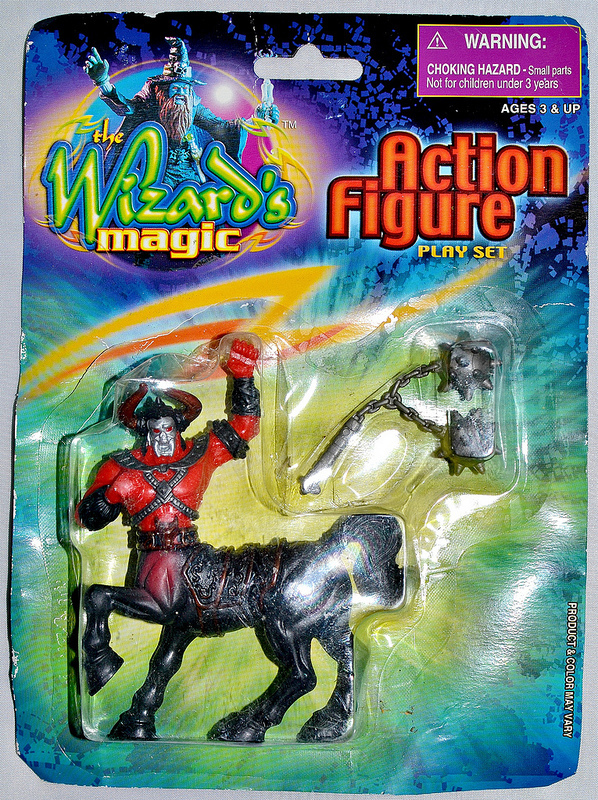 One of my favorite Chap Mei-produced lines is a fantasy-themed set of action figures named "The Wizard's Magic." The set consists of six different sculps--two wizards and four monsters--ranging from 3 to 4 inches tall. I'm pretty sure it came out between 2000-2002, which means it was probably spurred by the popularity of Harry Potter and Lord of the Rings around that time, although fantasy has always been one of the main themes found in Chap Mei releases. 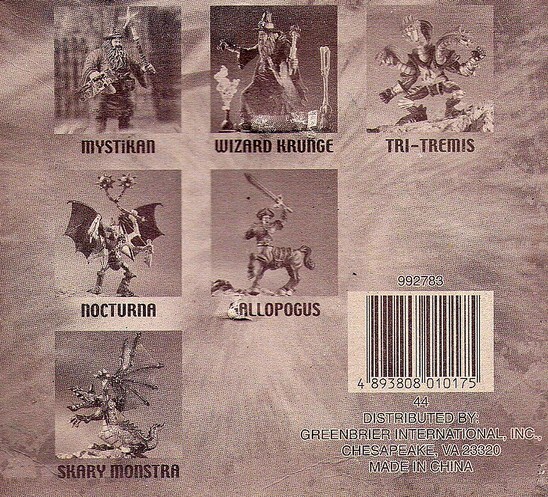 These figures were also released under at least one alternate name ("Magic World"), and were sold in multiple formats, including single-packs, two-packs and in a castle playset. There is a thread about the line on the Chap Mei Universe message board, where you can see examples of the various package types. Some of the same figures had been used in previous sets with different names, which is not uncommon for Chap Mei releases. 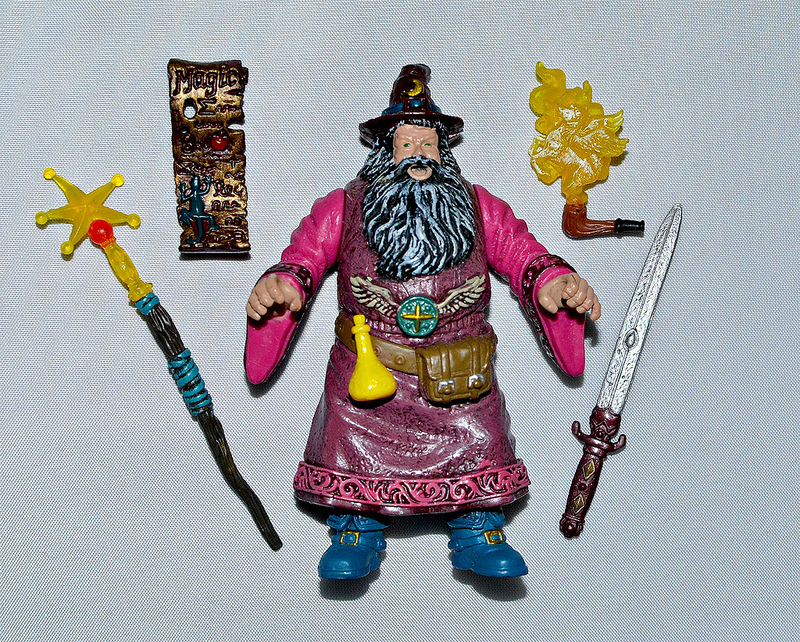 MYSTIKAN: This pink and purple-robed fellow seems to be the lovechild of Hagrid and Dumbledore. I assume he's supposed to be the good wizard of the set. Probably the coolest thing about him is one of his accessories is a pipe that actually fits into his mouth, and the pipe has flames in the shape of a pegasus coming out of it! How radical is that? WIZARD KRUNGE: Every good wizard needs an evil wizard to battle, and in this set Krunge answers that call. This is definitely my favorite figure in the set. For one, I love the sculpt and colors (check out that blue skin and orange beard). Also, he has some killer accessories, such as a nicely textured and detailed purple cape, an open book of spells and most importantly, a potion bottle with clear yellow flames in the shape of a freakin' skull coming out of it! Between the skull potion and Mystikan's pegasus pipe, Chap Mei really turned out some inspired accessories in this set. TRI-TREMIS: Anything that is a three-headed snake warrior is going to succeed on all levels just by being a three-headed snake warrior, and Tri-Tremis here is indeed awesome. All three of its purple cobra heads are articulated at the necks, which makes for some fun posing. I believe this figure originated in an earlier Chap Mei set called "Hercules," along with some of the figures below. NOCTURNA: I think this four-armed guy is supposed to be some sort of cross between a demon and a vampire. 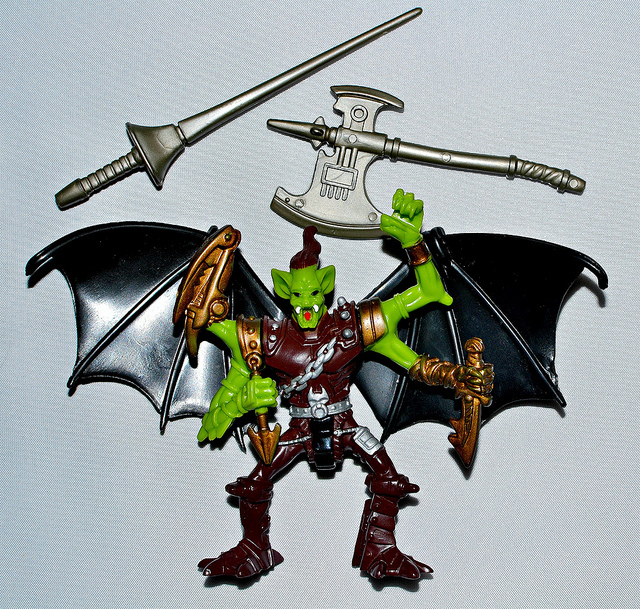 He comes with removable wings, a sword and an axe, in addition to weapons that are sculpted into some of his hands. To me, he's probably the least exciting of the set, but still cool. 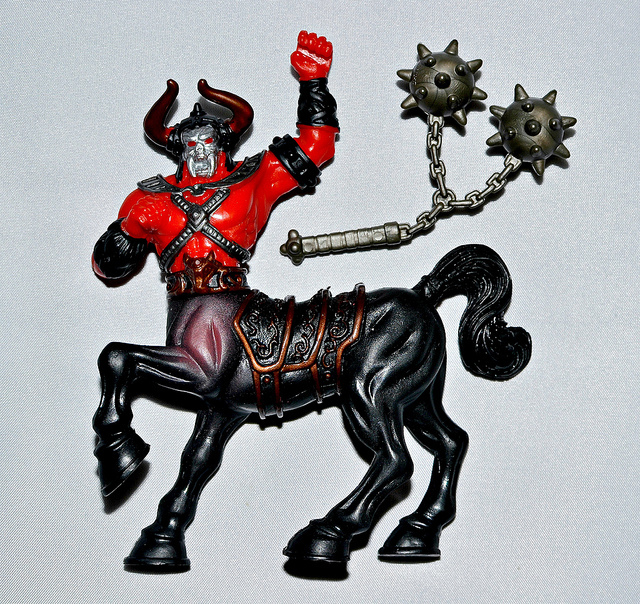 GALLOPOGUS: Aside from having a questionable name and only one point of articulation (his waist) versus two or three on the other figures in the set, this centaur is pretty badass. His bright red skin, silver face and horns give him a creepy demonic look. A centaur from hell. I'm pretty sure he's working on the side of Wizard Krunge. SKARY MONSTRA: Finally, what fantasy toy line is complete without a dragon? 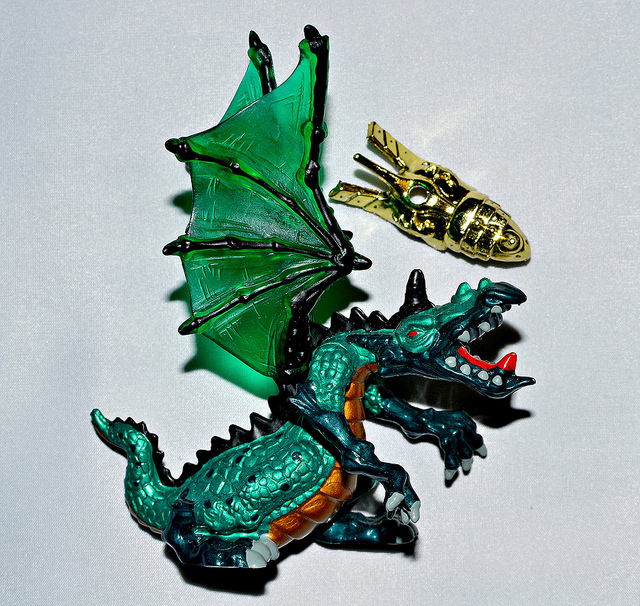 This baddie is so cool that they had to spell "scary" with a "k." It includes removable translucent wings and a gold headpiece that fits over the top of its head. Dragons can wear armor too, I guess. What makes the figure for me is the way they sculpted its face; Monstra looks properly pissed off and ready to eat someone, which is becoming on a dragon. And there you have it--The Wizard's Magic! 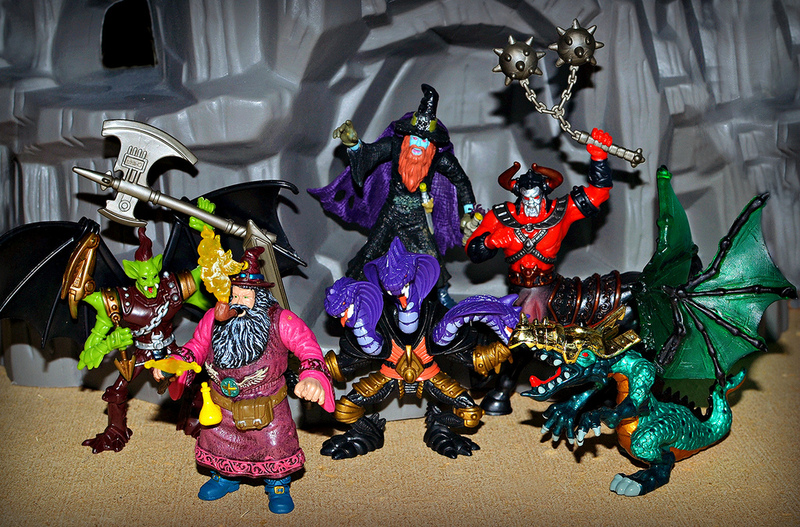 I daresay one of my favorite fantasy figure sets ever, thanks to the characters included, fun sculpts and excellent accessories. Evil/monster characters are usually the coolest-looking, and Chap Mei offered up five out of six here (and the one character that appears to be good has a pegasus pipe, which automatically makes him awesome, too). These are awesome! I was into Chap Mei off and on between around 2003 and 2008 and would pick up almost anything I could find. I don't remember these guys much, but they are insanely awesome. 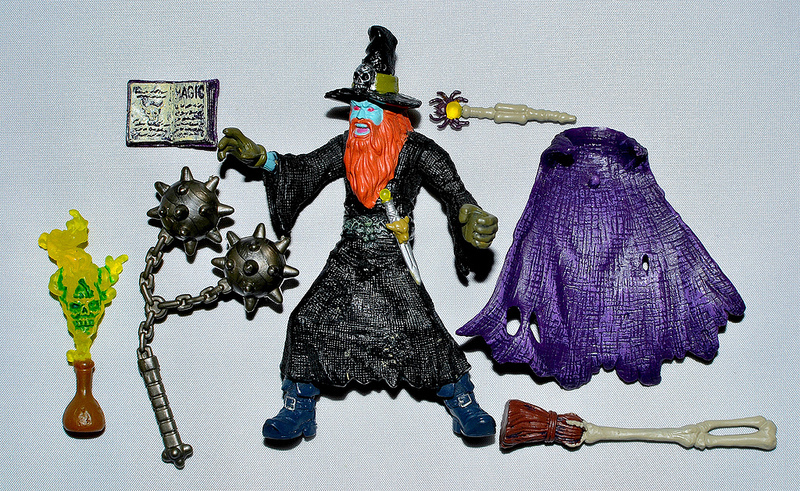 Mystikan and Wizard Krugne are two of the coolest fantasy based figures have ever seen. I love Mystikan's pipe and Krunge's pipe. These guys really are works of art. I mean, they're better than most of what the mainstream companies are pumping out in this scale in action figure aisles today. 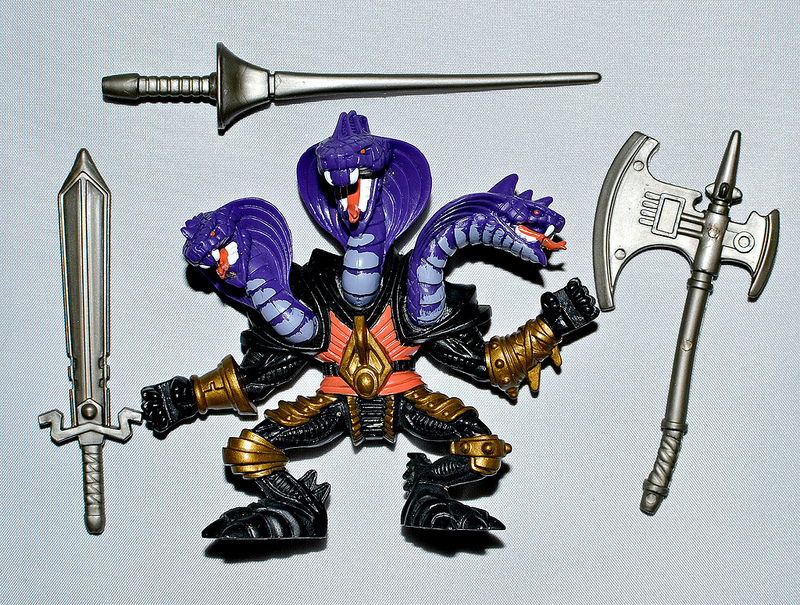 Tri-tremis kind of reminds me of one of those Mighty Max battle monsters without the whole opening up into a playset gimmick. He's incredibly cool. Thanks for showing these off. I think I need to check ebay for a Mystikan. Yeah, the figures are so great that I wish they would have done a second set. The recent True Legends Chap Mei figures which are sold at Toys R Us are also cool, but not to the level of these IMO. I really like that three headed snake guy. These are all wonderful. Chap Mei has put out some incredible figures over the years! Holy Chap, these are awesome! I wasn't collecting very many toys in the 00's, so I totally missed out on Chap Mei, this is my first time even hearing about them! I have set foot into a retail toy store for a long time, but looking at the kind of sets Chap Mei produces makes me want to stop by a TRU again! I love the cheesy names, "Skary Monstra", I seriously burst out laughing after reading that name! Yeah, the names are definitely part of the fun, haha. I love saying "Wizard Krunge." I just can't get over how cool these Chap Mei toys are! You should see the True Legends Orc Raiding Party set! Chap Mei is always great! I have all of these and love them too, I make them a part of my Beast Raiders fiction! I think I have (or had) a couple Beast Raiders too. Was the purple elephant a Beast Raider?